Hi, I am interested in your 1933 Chevrolet Other Chevrolet Models (stock #4696-ATL) listed on Autotrader for $44,995. I'd like to get more information about this vehicle and confirm its availability. 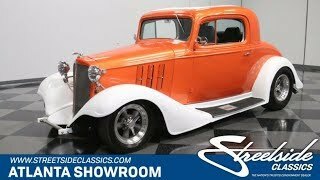 The early 30s may have been a rough time for the country, economically speaking, but they were sure a great time as far as automotive styling was concerned, as this 1933 Chevrolet 3 Window Coupe ably illustrates. In addition to its undeniable, attention drawing aesthetics, it also features modern V8 power, as well as a number of other upgrades that combine to make it well suited for the demands of frequent driving - and just imagine the looks youll get from behind the wheel. This 33 combines the Chevy coupes original stylishness with some well-planned customization to create a great result. The aftermarket touches on display here - the flaring front fenders, those broad running boards, and the cabins curved, chopped-looking appearance - may be amplifications of the original theme but theyre tasteful amplifications, as the Chevy coupes of this era were already seriously sharp cars even as they rolled off the line. The steel body and sturdy aftermarket frame on this car provide a number of benefits - its very well equipped to withstand the rigors of use and time itself without developing the stress cracks that often plague its fiberglass rivals. The orange and white color scheme draped over the exterior is nicely complemented by exterior fittings in great condition - the new front grille and headlights in particular were recently added and really stand out. Clean, clear cabin glass, as well as fresh rubber step pads attached to the running boards, also contribute to this Chevys vital, road-ready appearance. A great looking interior awaits, highlighted by a pair of late model gray leather bucket seats that blend in nicely with their surroundings and offer a level of comfort that would be well out of reach of the original design of the time. To each side, youll find custom upholstered door panels that feature diamond pattern tuck and roll surfaces and, if you step around to the back and raise the power operated deck lid, youll see that the trunk area has been finished to match. From front to back, the gray carpeting lining the floor is in very solid shape and the dash area has a very clean look to it, with its center-mounted chrome instrument cluster sporting a complement of white-faced Dolphin gauges, all of which are in working order, as well as an aftermarket AM/FM stereo. The pair of in dash vents just below warm or cool the cabin as needed via the added modern climate control system. The fuel injected 350 cubic inch LT1 V8 under the hood is at the forefront of a number of other upgrades to provide a great driving experience. Its in very good from, starting right up and pulling with conviction as it pairs with a 4-speed 700r4 transmission whose overdrive gear brings low RPMs at highway speeds. The powerplant sits in a nicely detailed compartment with its intake manifold painted to match the exterior and surrounded by a number of chrome components to provide a really great look inside. The featured Mustang II front end brings a number of benefits, among them noticeably more precise rack and pinion steering, coilover shocks that combine with the pair in back to equip this classic with a very nice ride and power brakes that position discs up front to bring prompt, low-effort stops. A set of American Racing wheels with spinner centers and wrapped with Cooper Cobra Radial G/T add even more stylistic flair to this very sharp classic. Equally well-armed for turning heads as it is for inspired, enjoyable driving, this 1933 Chevrolet 3 Window Coupe is definitely one to check out. Call today!